Dr. Devdutt Pattanaik is a doctor by education and has worked for 14 years in the Pharma and Healthcare industry. 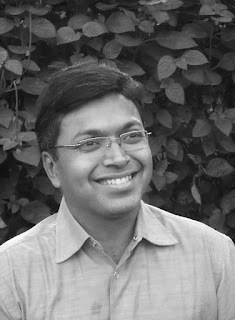 He is passionate about mythology and his columns appear in leading Indian newspapers. Currently he is working as the Chief Belief Office of Future Group (the group which runs Big Bazaar & Pantaloons in India). I had written about his talk at TED India (held in Mysore last year) earlier in the year. Today, it is my pleasure to interview Dr. Devdutt Pattanaik on All About Presentations. Vivek: How was your experience of talking at TED? Dr. Devdutt: It was very exhilarating. Did not know the impact until much later. Vivek: How did you prepare for the TED talk? How much time was spent in preparing? Dr. Devdutt: I had many versions of the presentations. There was so much to say and so had to edit it many times. This was version 5. Vivek: Did you rehearse your talk? If yes, how did you rehearse? Dr. Devdutt: Normally, I don’t need to prepare. Normally, I don’t have time-bound presentations. This was a strict 18-minute time slot. So had to practice to get all that content within the time. The practice shows, I guess. Vivek: Why did you start the talk with a story and what went into choosing the story? Dr. Devdutt: Stories work. Our brains are wired that way. These stories are part of my standard repertoire when I am explaining culture. Ideally this presentation should be for at least 50 minutes as I elaborate on each story. Here I had to just flirt with each one. Vivek: Were you not a bit afraid of talking to such a large audience? What did you do to reduce your nervousness before the talk? Dr. Devdutt: I have been a public speaker for a long time. So I am not usually nervous. This was different as I had a bad case of sore throat (first time in my life) for 3 days and it was just not going away. The antibiotics did not work but adrenaline saw me through. Vivek: Did you plan the ending of your presentation? Dr. Devdutt: Yes. That’s how I always end. The poem written by me years ago can be found at the start of all my books. It guides my work. Vivek: What are your learnings from the presentations you have made in your life? Dr. Devdutt: Be sensitive to what people want to hear or can hear, and not what you want to say….the rest will follow. If you want to know more about Dr. Devdutt check out his website www.devdutt.com. cool interview! Nice idea and well done! Good interview. Can we have more of these? Thanks. I am glad you liked it. Ofcourse we can have more of these. There is one more interview in line. If you have some presenter in mind, let me know.